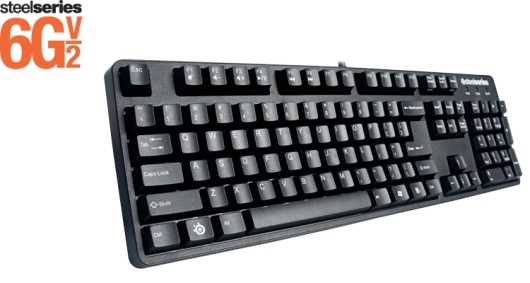 The Steelseries 6GV2 is an excellent keyboard for both gaming and word processing. The first thing to know about the product is that it is a mechanical keyboard. Steelseries is a great company that innovates their products with PC gaming in mind. Although slightly more expensive than the average keyboard on the market, the 6GV2 is designed for gamers and it stands out above other keyboards. 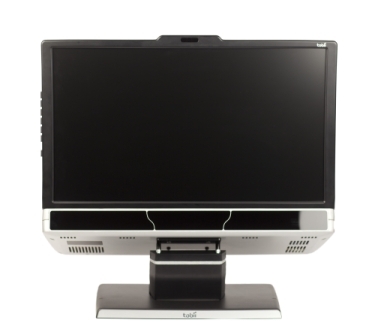 The 6GV2 is not very much to look at, but do not let that steer anyone away. Steelseries employs a very simple look for this model opting for an all black very boxy looking design when most other "gaming" keyboards use flashy colors and lights with character designs from other games to make the product look nice. In comparison this keyboard is very bland, which is too bad because the features of the keyboard are so much nicer than most other keyboards out there. Mechanical keyboards feel much different to use than other keyboards. It does take a little bit of time to get use to how the keys are laid out and how they feel, but after a week or so of use it begins to feel much more natural that other keyboards. 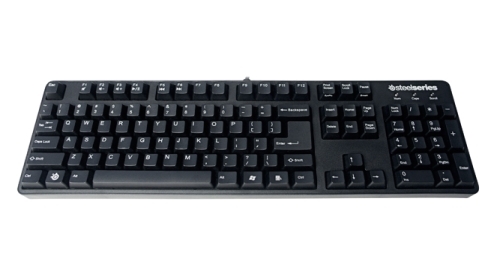 The 6GV2 is a mechanical keyboard, which means that it uses actual physical switches to determine when a key is pressed. The alternative, electrical current switches, is less expensive. That's why most people do not use mechanical keyboards, but gamers and people who use word processing regularly should consider making the switch. Since the switches are physical it improves the response time between key presses and actions on the computer. The keyboard will optimize the users actions per minute. This is very important for gamers especially those who play fast paced or online games. Most keyboards will only recognize a very limited number of key presses simultaneously; it's usually around 4-6. While plugged into the USB slot the 6GV2 will recognize 6 distinct key presses simultaneously, but if it is plugged in through the PS/2 slot the computer will recognize every single key pressed at the same time; although there may never come a time when that is necessary, many games require multiple keys to be pressed at the same time to perform more tricky maneuvers. In most games players are constantly pressing three or more keys at one time. The 6GV2 may have gone a little overboard on this feature, but it is nice to know that you could potentially press every key and the computer would know what you're doing. From a technical standpoint, virtual reality is nothing new. It has, up until now, largely been limited to certain niche markets, rarely making its way to the home entertainment sector. 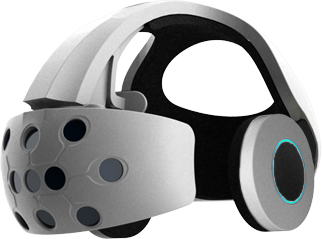 That said, with their latest product, Maryland based VR developer Sensics is attempting to change this; debuting the world's first Android powered, VR headset. Code named Project Natalia, these goggles differ from traditional virtual reality technology in a number of ways. First and foremost, unlike existing VR, these goggles can operate as a standalone device, without the need to be hooked up to a computer or other external video source. Project Natalia packs a dual core 1.2ghz CPU on board, along with the Android 4.0 (Ice Cream Sandwich) operating system, dual SXGA OLED displays, and built in bluetooth and wifi functionality. A second unique feature to the headset is the addition of a series of motion sensing cameras to the front of the device. With these cameras, hand tracking is now possible, as well as head tracking. According to Sensics, this opens up the possibly of a motion controlled VR simulation. Imagine, for instance, playing Fruit Ninja. Using Natalia, the flagship set of Smart Goggles, one could play the game in full range, high definition 3d, and could do so with a chopping motion, similar to Halfbrick's Kinect version of the game. As of this writing, Sensics did not have any announcements regarding potential partnerships with gaming manufacturers for Natalia enabled games. Gaming With Your Eyes - The Next Big Thing? Ever played a game just by looking at it? The concept, and the underlying technology behind it, may sound like science fiction. Simply stare at a computer screen, and it quickly and accurately responds to your gaze. Believe it or not, this futuristic tech is real, and further along than you may think. Tobii Technology demoed their eye tracking and interactive gaze technology at CES Unveiled, and even in this still in development phase, the results were nothing short of impressive. What began as a research project over ten years ago at Stockholm's Royal Institute of Technology, has now matured into a fully realized product. Tobii's demos consisted of gaze controlled window switching, a proof of concept that, when implemented, will give users the ability to change apps on their controller just by looking at it, in addition to EyeAsteroids, a sight controlled arcade style shooter. Tobii was quick to point out; EyeAsteroids is no mere proof of concept. To the contrary, it is a full retail product, that holds the record of being the world's first and only eye-controlled arcade game. Introduced as an arcade cabinet stateside at Dave & Busters restaurants in November of 2011, this groundbreaking shooter removes the traditional joystick in favor of full eye recognition. Winter Spectacular Day Five: Win a Powerbag! The Winter Spectacular is in full swing! We've been giving you a shot at some awesome gaming prizes all week, and today is no exception. On deck for today is a Powerbag backpack, courtesy of RFA Brands, Inc. While it may initially look unassuming, this bag packs a punch! With an enclosed 3000mAh battery, and the built-in PowerVine system, the Powerbag can charge almost any USB device on the go. Smartphones, iPads, gaming devices, you name it - as long as it has a USB connection, this bag can charge it. Charge your gadgets anywhere with this stylish new backpack. As anyone who uses a handheld or mobile device on a frequent basis will attest to, portable electronics eat batteries. Sure, we try to be diligent in charging them, but let's face it - there are often times when juicing your various gadgetry just isn't a viable option. Need to charge your cellphone on the go? Forgot your digital camera's USB cable before going on that big trip? Enter the Powerbag from RFA Brands, Inc. Available in backpack, messenger bag, and briefcase varieties, it aims to provide a comfortable, readily available charging solution for portable devices. 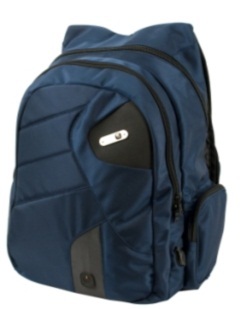 The entry level backpack model starts at $139.99, and includes a removable 3000mAh battery, along with an AC adapter. At first glance, the Powerbag is virtually indistinguishable from a standard backpack. 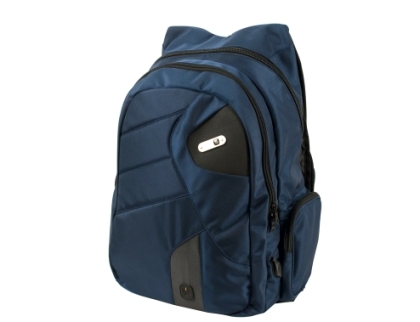 Sporting a simplistic, yet functional aesthetic, many of the electronic components are designed to blend in with the rest of the backpack. This isn't so much a battery that can hold your portable devices, so much as it is a backpack with a built in battery. Take the power button, for instance - to the untrained eye, it looks nothing more than a rubberized patch used to designate the brand name. In reality, it is the backpack's on/off mechanism, which also doubles as a battery life indicator. A quick tap will illuminate a series of LEDs hidden in the surrounding area, showing how much power is left in the battery, while pressing and holding the button for 3-5 seconds starts the charger.